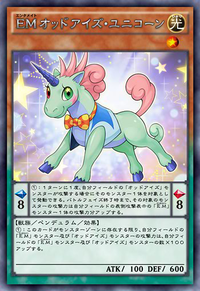 Main card page: "Performapal Odd-Eyes Unicorn"
Once per turn, when an "Odd-Eyes" monster you control declares an attack: You can target that monster; until the end of the Battle Phase, that target gains ATK equal to the ATK of 1 face-up Attack Position "Performapal" monster you control. All "Performapal" and "Odd-Eyes" monsters you control gain 100 ATK for each "Performapal" and "Odd-Eyes" monster you control. This page was last edited on 8 August 2017, at 18:01.